Little TV viewers always dream of that big day, when their favorite TV characters find the love of their lives and say “I do.” As a viewer and reviewer who has been watching Modern Family from its early beginnings, all the way through to its fifth season, it is so exciting for me to watch two of my favorite characters walk down the aisle together. Unfortunately, Cam and Mitch are running into numerous problems, and my joy and tears at watching their union has been (in the most hilarious ways possible) delayed ‘til next week. Putting all the hilarity aside, the core of this episode is the ongoing fight between Jay and Mitch who aren’t on speaking terms. You can’t choose your kids, and you can’t choose your parents, but in our country, people choose their spouses. Your spouse is someone you have chosen to make a family member, which is a big signifier of the importance of the ceremony. It is an announcement and a proclamation of love and devotion. Unfortunately, Mitch and Cam’s fathers have a hard time announcing it to the world. In the steam room at the club, when the other gentlemen begin to question them about the nuptials, they both become extremely uncomfortable and avoid discussing it. Most children, whether young or grown, search for approval and appreciation from their parents. When Mitch and Cam’s fathers are unable to proudly take part in their sons’ joy, their discomfort is understandable, but at the same time heart-wrenching. 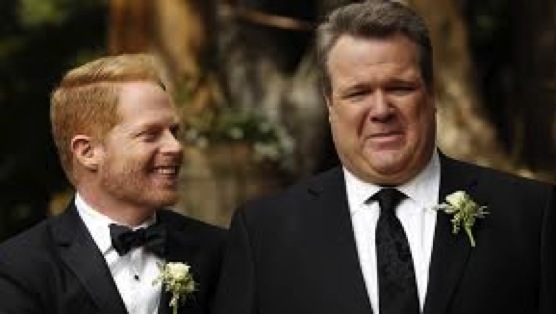 All the characters in Modern Family are lovable and relatable, but Jay is the most flawed and controversial on the show, which in turn makes him the most interesting character with the most depth. Now, I am an avowed Team Cam member, but Jay has this mix of cynicism and sweetness that makes him much more of a character study than the rest. In the episode, “Three Dinners,” where his best friend is leaving town, Jay pretends not to care but in truth is devastated, which was heart breaking to watch. The show is titled Modern Family, and it represents families in our contemporary society, but Jay is of a previous generation. In many ways, the title represents his experience because he is the one learning how to be a part of the modern family structure. Hopefully by next week he will surpass these humps and be able to partake in his son’s joy. And if he doesn’t, I’ll be happy enough for the both of us. Hell, I might even wear a dress for the event and treat myself to champagne and cake.